BRAND NEW 6TH EDITION: SEPTEMBER 26, 2016. This is the definitive and authorized historical account of the extremely influential, blueswailing YARDBIRDS. With the successive guitar attacks of Eric Clapton, Jeff Beck and Jimmy Page, The Yardbirds as a unit reached uncharted territories in rock. In Yardbirds: The Ultimate Rave-Up you'll discover how The Yardbirds forged their own identity and left a lasting impression on music fans and musicians. Using The Yardbirds as their blueprint, many bands like Aerosmith and The Allman Brothers have incorporated Yardbirds techniques in creating their own identities. 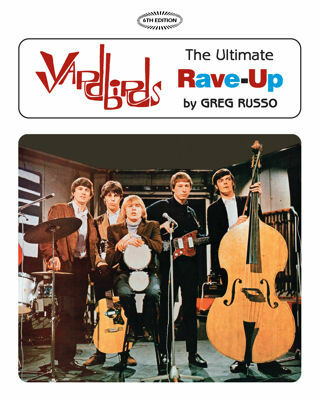 Written by Greg Russo, liner notes author and compiler of Little Games Sessions & More (EMI), Cumular Limit (New Millennium), EMI's Little Games single CD, and the new 5-disc set Glimpses 1963-1968 (Easy Action), Yardbirds: The Ultimate Rave-Up reveals Greg's unique insider knowledge in a captivating written style. All of the band's members, past and present, have contributed to this edition. The book also includes full Yardbirds group and solo discographies, a detailed concert history, and 300+ Yardbirds-related photos and extremely rare record covers. The current lineup of the band is raving up about it!